Hong Kong pop star Eason Chan sings the theme song for Taiwan pop-star-turned-director Rene Liu's much anticipated romantic drama "Us and Them." The music video for the song "Us" was released on Monday, receiving 2 million views in just two hours and becoming an instant smash on various Chinese music and video charts. The two stars rarely collaborate with each other, but fans of Chinese pop have long recognized that their artistic sensibilities are similar; a saying in music circles goes that "sad people should not listen to Eason, and lovelorn people should not listen to Rene," suggesting that romantic songs from both performers resonate strongly with audiences. At a press conference for the film on Tuesday in Beijing, Liu revealed to China.org.cn that she decided very early that her close friend Chan would be the best choice to sing the song, and said she felt that his understanding of life and love would allow him to interpret the song through his performance. The song was composed by Chen Chien-ci, with lyrics written by Ge Dawei and the music video directed by Shen Xiaowei. "Actually, the song was very difficult to perform. Eason sang the song with so much power that I was afraid he would hurt his back," the composer said onstage while promoting the film. But Chan laughed and explained that "I just used my back muscles to sing my best." The singer also said he felt Liu was a very fitting choice to narrate a love story. "She is a unique woman," he said, while Liu said of her philosophy while making the film, "Time is not used to forget love, but used to witness love." 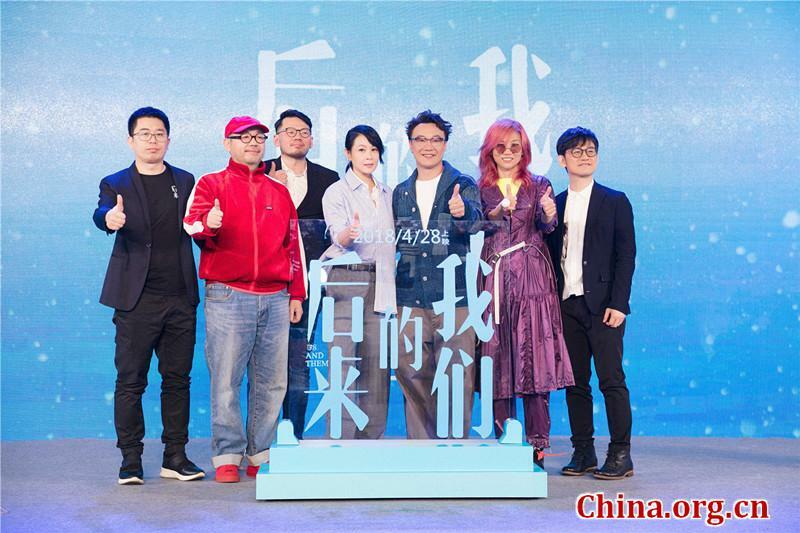 Liu has had many hits in the past, including the well-known love song "Afterward," which was believed to inspire the new movie and has already ignited people's nostalgia in anticipation of the film project. The pop singer also starred in many films before deciding to unveil her directorial debut this time. Liu said it was painfully cold shooting the film in Hailar, one of China's coldest places in the winter of 2017 at minus 40 degrees Celsius. But she said she felt proud and happy to make the film with all her friends in the industry. "Us and Them" stars Jing Boran, Zhou Dongyu and Tian Zhuangzhuang. It is scheduled for release in Chinese theaters on April 28.